Rugged Idaho occupies an almost mythical place in the American imagination. The final home of Ernest Hemingway, the qualities that transformed the writer into a literary icon are the same that have made Idaho legendary. It is a harsh landscape of jagged peaks, waterfalls, and deep canyon gorges, where the hardiest outdoorsmen can find adventure. Idaho also offers opportunities for fly fishing, skiing on pristine slopes, and viewing wildlife in its natural habitat, all in a dynamic environment that has, to a large degree, remained unspoiled. In the early 1800s, explorers Lewis and Clark dazzled Americans back east with descriptions of Idaho. Pioneers began to trickle into the territory, growing Idaho from frontier outpost to posh locale. The real estate market has exploded, particularly in resort areas, with several celebrities taking up residence. Sun Valley, the state's original ski destination, is now a magnificent vacation spot. Idaho is a perfect destination for outdoor recreation, from boating and white-water rafting to rock climbing and horseback riding to skiing and dog sledding. But, unlike neighbouring Colorado, the state remains hidden away, tucked into a far corner of the US. Even the fashionable resort towns, like Sun Valley, Ketchum and Coeur d'Alene, for all their luxury remain laid back and unhurried. 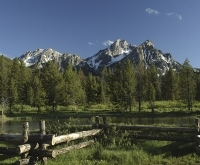 In spite of its increasing popularity, Idaho has maintained its small-town, friendly nature. Boise, the state capital and largest city, has fewer than 220,000 residents. It is this atmosphere that makes Idaho the ultimate escape.